It was forty years ago today. Thanksgiving Day, November 25th, 1976. The Winterland Ballroom in San Francisco, California played host to one of the most remarkable concert events ever. In the beginning, The Band decided to hold a concert in the first place they had played, some sixteen years earlier. What began as a concert, turned into one of the most recognized music movie events of a generation. Forty years later, it is beyond legend, it is iconic. 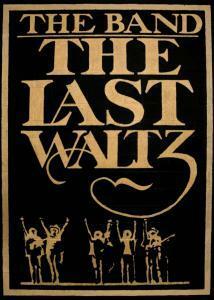 We’re taking a look back at The Last Waltz, warts and all. Planned, not as a final concert ever, it was to be an event that would see members of The Band go their own ways, for a time. Members of the group were looking into solo projects, recovering from injuries, and suffering from road fatigue. Lead guitarist, Robbie Robertson, came up with the idea to give their fans a Thanksgiving gift. A show that would reunite the group with their earliest influences and allow a jumping off point for band members to launch their solo projects, recuperate, and then, eventually, return bigger and better than ever. Almost from its very inception, the simple plan began to snowball. When all was said and done, those five artists, and over a dozen more, joined in the celebration. 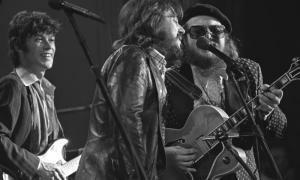 Dr. John, Bobby Charles, Paul Butterfield, Muddy Waters (with his band members, Pinetop Perkins and Bob Margolin), Joni Mitchell, Neil Diamond, Ron Wood, Ringo Starr, Stephen Stills, Carl Radle, the Staple Singers and Emmylou Harris all took part. Several poets also took to the stage, and the 5,000 fans in the crowd were treated to a full Thanksgiving dinner, compliments of promoter extraordinaire, and Winterland owner, Bill Graham. As we all know, it didn’t stop there. Famed film director, Martin Scorsese, was brought in to record the entire extravaganza. With him came several well known cinematographers, including Michael Chapman, Vilmos Zsigmond, and László Kovács, who operated seven 35MM cameras. This was the first time in history that 35MM had been used to record a concert and it caused major problems as the shoot went on. Hollywood production designer, Boris Leven, was hired to decorate the stage and design the lighting. Among his decorations were the crystal chandeliers used in Gone With the Wind. For those lucky, or wealthy enough, to afford the $25 tickets, the concert was, as many are, fraught with technical issues. Out of tune instruments, lackluster performances, and timing issues plagued the show, but for the millions who saw the concert on film, it was spectacular. Chicago Tribune film critic, Michael Wilmington, called it, “the greatest rock concert movie ever made – and maybe the best rock movie, period.” Terry Lawson, of the Detroit Free Press, wrote, “This is one of the great movie experiences.” Why? Because the glitches were all fixed in post-production. Band drummer, Helm, wasn’t the only one to point out the differences between the live show and what fans saw on film. Another example was the horn section, with their parts arranged by famed New Orleans musician, Allen Toussaint. Although their performance throughout the concert was spot on, there were issues in how they were recorded in the remote truck. That isn’t where the issues ceased. One particular artist, Bob Dylan, negotiated his performance right up the last minute. Fifteen minutes before he was scheduled to go on, Dylan arrived at the venue and announced that he would not be appearing in the film after all. He was reluctant largely out of concern that The Last Waltz would compete with his own upcoming concert film, Renaldo & Clara (1978). With five minutes to go, Graham convinced Dylan to agree to be filmed for his last two songs only. To make it clear that he wasn’t being filmed, the cameras were physically turned away from the stage during his first few songs. After the show, Dylan’s lawyer seized the footage for future negotiation purposes. Luckily, one of the high points of the production was captured, without Dylan’s knowledge at the time, and preserved for posterity. As the crews tried to wrap up at the agreed-upon time, Bill Graham rushed in to countermand those instructions. 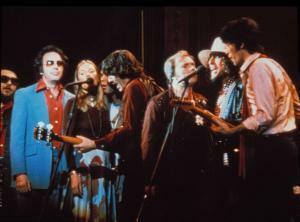 That is how the sing-along of “I Shall Be Released,” which featured Dylan, and The Band, along with Wood and Starr, was documented. 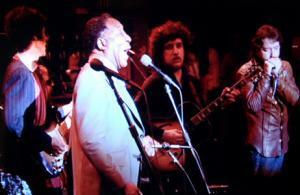 The performance by Chicago blues great, Muddy Waters, almost didn’t happen at all. However, Waters’ performance may not have been captured on camera, if not for sheer luck, and director, Martin Scorsese’s temper. Thanks to The Band making some changes on the fly, Scorsese grew frustrated, screaming into his headphones to make last-second cue changes to his camera crew. Cinematographer, László Kovács, couldn’t handle it and ripped off his headset. With Scorsese thinking a different song was coming up, he ordered all the cameras to shut down, just as the blues legend launched into “Mannish Boy.” Fortunately for us, Kovács didn’t hear Scorsese’s order, which is why the only footage of Waters’ performance came from his camera. It did seem that most of the guest artists had a connection to The Band. They were original masters of the genres that Robertson, Helm and company emulated, or they were artists or groups that they had worked with in the past. Again, most of them. Enter Neil Diamond. Diamond appeared at the insistence of Robertson, who had recently produced Diamond’s album, Beautiful Noise, which also featured himself on guitar, Garth Hudson and Dr. John on Hammond organ. The song that Diamond performed, “Dry Your Eyes,” from that album was also co-written by Robertson. Diamond was also involved in a couple of humorous situations while in attendance. One of them was when Neil Young introduced himself backstage. The other has its base in rumor. As the story goes, Diamond, feeling pretty good after his performance of “Dry Your Eyes,” challenged Dylan to, “follow that.” Dylan allegedly responded by asking, “What do I have to do, go on stage and fall asleep?” When Rolling Stone asked Diamond about the incident in 2010, the story had somewhat changed. Dylan apparently replied only with a quizzical look to Diamond’s statement, which also differed from the original story. With the exception of the Staple Singers and Emmylou Harris, who were recorded on an MGM studio soundstage days after the show, all the acts performed live on the Winterland stage. The concert, which began at 9 pm, was still going strong into the early morning hours, with encores and two jam sessions. When it finally came to a close, the artists were physically and mentally exhausted. After all, The Band had to learn twenty or more songs they had never played before, and then play them with their guests. Perhaps the coolest performances in San Francisco on that day, the night before, and the day after, were only heard by the musicians themselves. The Band had reserved the entire Miyako Hotel for their guests, and where you have all that talent in one place, impromptu jam sessions are bound to break out. Some took place the evening before the big show. In a 2013 interview with American Blues Scene, Dr. John recalled the pre-concert get together. With the actual concert over, and the artists safely back at the Miyako, the music still didn’t stop. The blues artists, with the exception of Waters and Perkins, gathered together and another jam session broke out. It began around 7 AM, and lasted well into the day. The main thing, however, is that even with all its flaws and glitches, The Last Waltz will be remembered as one of the greatest gatherings of a generation. Some people, such as Helm, remembered it as a catastrophe. Others, such as the aforementioned journalists, the millions of people, all over the world, that have seen the film, or heard the soundtrack, and Robertson himself, look at it from a 40 year distance and are satisfied.